Regardless if you’re a daring, outdoor adventurer, or a parent looking for a fun destination for your kids, you’ll find all the excitement you need in Draper, UT. And, at Volkswagen SouthTowne near Draper, UT, we’re ready to suit you up with a dependable, certified pre-owned Volkswagen that’s suited to your unique personality. Thanks to our commitment to trustworthy vehicles and our large selection, you’ll quickly locate the ride that perfectly aligns with your family’s lifestyle and daily activities. That way, you’ll be equipped with a certified pre-owned Volkswagen automobile that has the cargo space, technology, and safety you want most. When it comes to your search for the right vehicle, there’s nothing more important than walking into a dealership that’s stocked with lots of options. By doing so, you’ll ensure that you can more effectively identify the certified pre-owned VW that’s best for your needs. Well, that’s exactly why our showroom comes with a vast inventory of CPO Volkswagen cars, all which offer up the peace-of-mind of a multi-point inspection and available warranties. With these extra assurances, you can feel confident that your VW Jetta, VW Passat, or any of our other models will provide you with plenty of stability for your journey to Loveland Living Planet Aquarium or Cowabunga Bay. And, just like any of the VW vehicles in our lineup, you’re welcome to customize the cabin to include the gadgets that’ll make your commutes even more convenient. All you have to do is ask our sales associates about the optional features and packages that accompany your favorite model. From there, you’ll adorn the interior with that responsive touchscreen or those active safety technologies that you’ve been dreaming of. 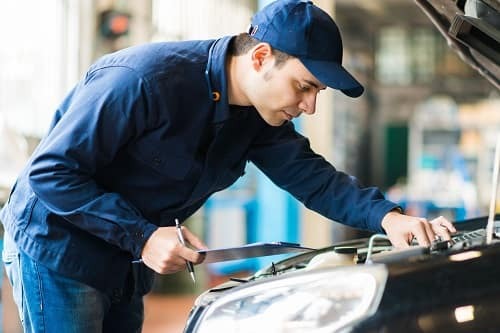 100+ Point Inspection: To ensure that you can rely on every inch of our CPO Volkswagen cars, we perform a comprehensive review of the most critical parts of each automobile—from the engine to the transmission to the brakes, and everything in between. CARFAX Vehicle History Report™: In addition to the inspection, you’ll receive a record of your vehicle’s previous life in the form of your CARFAX Vehicle History Report™. This review provides you with information about your car’s past owner(s), prior accidents, and more. With this report, you’ll be able to better determine which certified pre-owned Volkswagen is right for you. Once you’ve finally decided upon the Volkswagen certified pre-owned automobile that’ll effortlessly carry your loved ones along the road, you’re ready to learn more about your purchasing options. Luckily, our team of financing experts is here to guide you through every step of the process, no matter if you want to lease or buy your certified pre-owned car. To get started before you stop by our dealership for your first visit, simply apply for pre-approval online. After our staff has reviewed your application, they’ll contact you to speak more about your opportunities. Find Your Certified Pre-Owned VW near Draper UT! At Volkswagen SouthTowne, we want to help you make the most of your next jaunt through Draper, UT, by arming you with the capability and performance of a certified pre-owned Volkswagen. So, if you’re looking for an automobile that won’t hesitate to handle anything you encounter on the highway, search no further than our dealership. Ready to discover more about what our CPO models have to offer? Stop by our showroom or schedule your test drive today!